The latest all-out EVE Online war has come to an end, and there’s a clear winner and loser. The Guardians of the Galaxy coalition has agreed to surrender a vast amount of in-game assets to its foes The Imperium in exchange for a cessation of hostilities. The massive war between the Northern Alliances and the Imperial Legacy coalition has seen thousands of individuals commit tens of thousands of hours to the conflict over the past few months, with a dedicated few being involved for almost a full year. The treaty calls for a full stop on organized Imperium invasion of space owned and inhabited by GOTG for six months. This will allow the players living in that space a chance to regroup, rebuild, and begin to refill their in-game wallets. This war has been costly and has been waged heavily against GOTG’s industrial infrastructure, as well as their military holdings. Without a chance to earn ISK, the game’s currency, during the war, many players have seemingly abandoned the GOTG coalition, hoping to find a peaceful place to play. The cost of peace, in this case, has been quite significant. Leading up to the signing of the treaty, the Imperial Legacy coalition has been on a string of undeniable victories, destroying fortifications and disrupting GOTG’s operations on a massive scale. In a single day, September 19, the group destroyed four separate Keepstar battlestations belonging to GOTG and its allies, a feat that the game has never seen completed before. To stem the tide of violence against them, and secure their remaining holdings, GOTG agreed to give Goonswarm Federation a large portion of the limited-edition Faction Fortizar structures located inside of their space. These structures were generated by CCP Games earlier this year to replace EVE’s aging player-built outposts. About 1,200 of the structures were created, and CCP has said that no more of these types will ever be made. 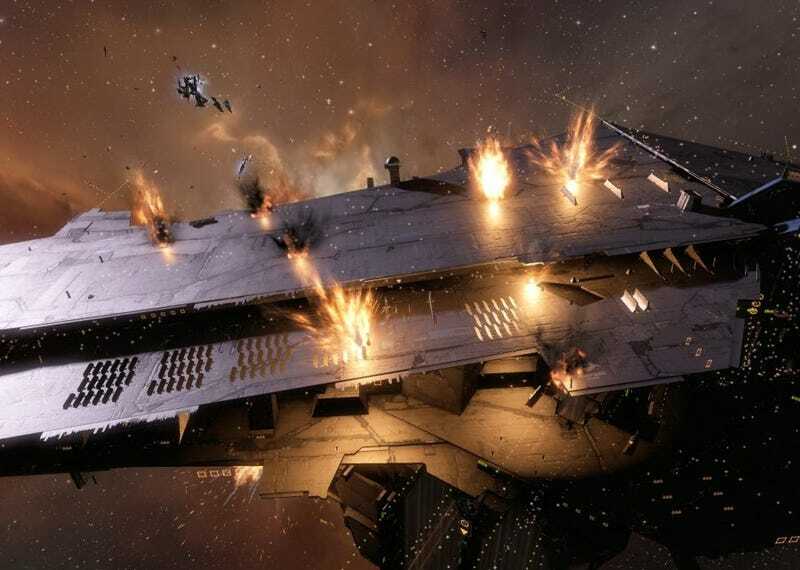 Since these structures, like most things in EVE, are vulnerable to destruction, their numbers have already begun to decline since their introduction, with nine being destroyed during this war alone. GOTG promised to deliver 40 of these rare structures as a payment to secure peace. The treaty estimates this to be worth at least five hundred billion ISK, the in-game currency. That’s somewhere in the ballpark of $6,500..
Because this is EVE and EVE players take their spaceship game very seriously, the peace treaty’s terms are spelled out very explicitly. Members of the various alliances involved are listed in detail, and payment terms are specified as to leave no questions or wiggle room. Perhaps most importantly, there is a clause which specifically states that this document is to be kept in complete secrecy. “Both parties will maintain the secrecy of the agreement as much as possible,” the document read. “Imperium will also attempt to reach a ‘natural stopping point’ after the main Keepstar kills and use that as cover to withdraw.” In other words, the original intent of the agreement was that leadership on both sides would pretend that the deescalation of hostilities was a natural ending and that a transfer of assets was not involved. This would have allowed both sides of the conflict to control the narrative surrounding the end of the war, and make sure that their members saw the peace as an ideal solution. Obviously, something went wrong with the secrecy provision of this attempt at a backroom deal, since the treaty leaked. It would seem that not everyone involved in the deal was overly happy with it, and before it could even go into effect, the document was posted on Reddit. This caused quite a bit of drama, as the deal came to a complete and total surprise to almost every member of all of the alliances involved. The deal had been brokered in utter secrecy at the topmost levels of each involved alliance, with the knowledge of only 10 to 15 players out of the thousands involved in the war. This caused quite a bit of diplomatic fallout between members of the involved alliances, especially inside of The Imperium. Since The Imperium had been on a very clear winning streak, the idea of suddenly accepting peace as the war approached territory that only a few years ago, they had considered home was not universally welcome. The Initiative, a long-standing member of The Imperium hosted an Impromptu “State of the Alliance” meeting to discuss the terms of the deal, how it affected their members, and their grievances with the terms. Goonswarm, the largest alliance inside The Imperium, and the ones who spearheaded the treaty, hosted their own “Fireside” style Q&A session with their leader, The Mittani. A ‘Prometheus’ class Faction Fortizar. In spite of all the drama surrounding it, the deal now seems to have been accepted by all sides. As per the provisions of the treaty, hostilities in the northern territories have been winding down as the final day of the war, September 29, approaches. Imperial Legacy fleets are consolidating at their forward staging base and preparing to make the trek home, under cover of the diplomatic agreement. The Imperial Legacy coalition itself is beginning to have talks of its own future, as it was founded in response to this very war. It is likely that The Imperium and Legacy Coalition will default back to their pre-war position of being “neighborly enemies” in the foreseeable future. War is one of the most exciting times in EVE Online, and drives almost every aspect of the game for a large portion of the player base. Over the next few months, the players involved will retreat to their home areas, begin to repair the damage done to their wallets during the war, and, surely, start preparations for the next one.